An umbrella stroller is a smaller, lightweight stroller that usually collapses like an umbrella, but they also can fold in half or thirds. They are useful for crowded locations, lifting into and transporting in a car, public transportation, or when flying. Being smaller, more maneuverable, and more compact when folded, they can be used in an airport, and then placed in overhead storage on a plane. They are not a replacement for a standard stroller but more of a supplement to a standard stroller. The best umbrella stroller is subject to personal choice, but there are a few things you should look for, as we discuss in our guide. Since umbrella strollers are intended to be lightweight, they usually have aluminum frames with strength built into the framework. They also use lightweight, durable fabrics that are easy to clean. The best choice is fabric components that can be removed and machine washed. The folding mechanism should be designed to be durable enough to withstand repeated use. The size of an umbrella stroller is the main feature. It has to be large enough to be comfortable for your child but small and lightweight enough to make it maneuverable and easy to handle. Umbrella strollers can weigh between eight to 18 pounds. Try to find the lightest, most durable umbrella stroller you can. A five-point harness is the best option. As you are shopping, test the harness to see how easy it is to fasten and unfasten. If you do not actually try fastening it around your child, consider any issues that might arise if you are trying to fasten it around your child. Umbrella strollers may have four or six wheels. Those with six wheels have dual wheels in the front. The dual wheels do not work as well off of smooth pavement. They tend to snag and get turned in a different direction. The size and composition of the wheels should be considered. Larger wheels are better when you are not on smooth terrain. Plastic tires also struggle on rough terrain. Air-filled bicycle-type tires handle any terrain but can develop a flat. Foam-filled tires are the best choice. You should also check the suspension on the stroller. If the stroller does not have any suspension, every bump will be felt by your baby, disrupting naps. The other choices are two-wheel or four-wheel suspension. Four-wheel suspension makes the stroller easier for you to push on all terrains and provides a smooth ride for your baby. Two-wheel, front or rear suspension is adequate. Brakes should be quick and easy to use to make sure that there is no temptation to not use them for a short stop. When you are checking how the brakes operate, think about whether you will be using the stroller while wearing sandals and how the brakes will work with sandals. The brakes may be on the front or rear wheels. Since you and the handle are in the rear, rear wheel brakes would probably be easier. Having a separate brake pedal on two separate wheels may tempt some parents to only set one brake. A single brake pedal is best. If you are choosing between single-action and double-action brakes, single-action brakes are easier and therefore, a better choice. The best choice is to have a pedal to step on to engage the brakes and a pedal to step on to release the brakes as opposed to pushing up on a pedal to release the brakes. Hand brakes are also offered on some strollers. There are two issues to consider with extra features. First, extra features can add more weight and add to the price of an umbrella stroller. Second, you should not just check to see if a stroller has a particular feature. 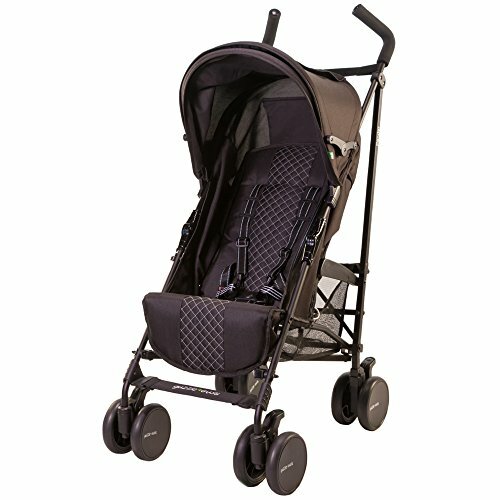 You should check and compare the quality of the features on each stroller. A canopy is an important feature, and it should offer UV protection. 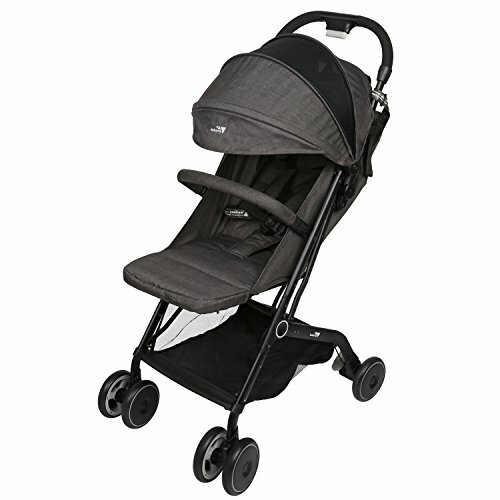 Many strollers have sides on the canopy with windows so that parents can see their children. If you want to use the stroller for a child under six months, the stroller needs to be able to recline, or you need to be able to securely attach a car seat because children under six months cannot sit up and need head support. To be comfortable for long trips, even older children can use a stroller that has an adjustable back and leg rest. Storage space for items your child may need or items you pick up while running errands is also important. More umbrella strollers are including storage space. Check the weight limits for the storage space. One-handed folding is a major convenience when you want to put the stroller back in the car or in overhead storage on a plane. Magnetic catches are quieter than Velcro and less likely to wake up your child. In addition, manufacturers are expanding the folding mechanism to create auto-locking and self-standing strollers. These features help keep the stroller compacted and allow you to sit the compacted stroller aside until you are ready to reopen it or put it in a car trunk, in overhead storage on a plane, or store it at home. You might also want to consider a shoulder strap or a travel bag to make carrying the stroller easier. 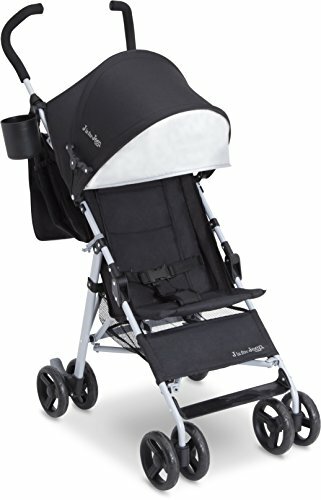 Some other items to consider are a rain protector, extra storage in the form of a storage organizer that attaches to the handle, and connectors that connect two strollers. If you do add a storage organizer to the handle, make sure that how you load it does not make the stroller prone to tipping. There is a new category of lightweight strollers. They are designed to be lightweight, fold compactly, and include many of the features discussed. They will be on the heavier end of umbrella strollers weight wise, but you may be able to use one of them instead of having both an umbrella stroller and a standard stroller. When considering the price and your budget, do not go to the extremes on either end. The highest priced stroller with a ton of features may not be the best quality, and you will probably be paying for features you do not need. However, do not just select the cheapest stroller because it could be a miserable experience. Just carefully decide which features you want and find worth the price. Remember that a better quality stroller has a better chance in the resale market. Do not forget that you might be able to use some of lightweight strollers instead buying an umbrella stroller and a standard stroller. Generally, umbrella strollers are for children up to 4 years old and under 50 to 55 pounds. Read the manufacturer’s age and size restrictions in the owners manual for specific strollers. If you see the JPMA certification (Juvenile Products Manufacturers Association), then you can be sure that the stroller is safe. Always be aware of the risk of the stroller tipping, and check online periodically to make sure that your stroller has not been recalled. Look for any risks of your child falling out of the stroller or getting their fingers caught anywhere in the stroller. 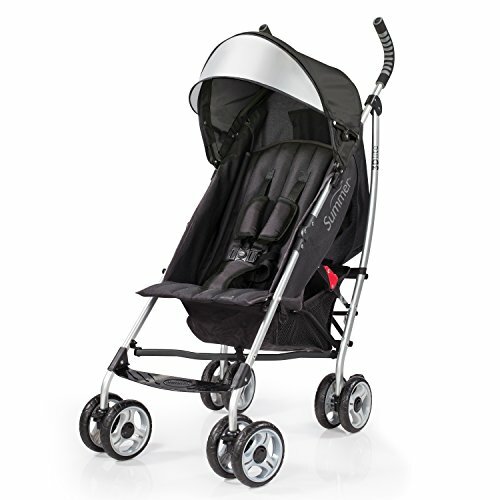 The Baby Cargo Series 300 Lightweight Umbrella Stroller has a lot of features that you may want. It has a reclining seat with an infant positioner providing support for babies under six months. It has an adjustable back and footrest so that older children can be comfortable on long trips. The five-point harness has soft plush straps and a single button release. The sunshade offers UV protection and Go Grommets with straps that allow you to attach a pacifier and toys. The frame is rustproof, has dual swivel wheels in the front and back, and front and rear wheel suspension. The suspension provides a smooth ride, but the dual wheels do not work as well on rough terrain as a single wheels do. 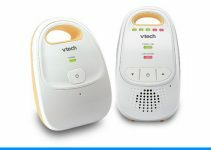 It can support a child up to 50 pounds. The reversible seat-cover is 100-percent polyester and machine washable. It folds to a compact size of 42.5″ x 11″ x 12.5″, provides a shoulder strap and handle for carrying, and weighs 20.5 pounds. Baby Cargo Series 300 also provides a large under storage basket, a zippered compartment on the back, a smartphone pocket, a rain guard, and a cup holder. 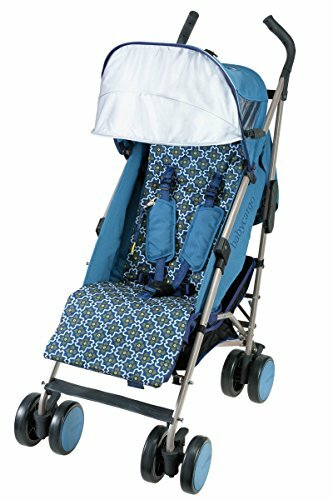 The Mamas & Papas Cruise Umbrella Stroller has sunshade with storage pockets, a toy loop, and a window to provide parents a view of their child. For more comfortable seating, it offers an adjustable back and leg rest. The stroller has four sets of dual wheels. This can make it harder to maneuver on rough terrain. You can lock the wheels to make it easier to maneuver. However, it does have four wheel suspension providing a smoother ride for your child. For your child’s safety, it has a five point safety harness. It uses an umbrella fold, has a shoulder strap for carrying, holds a child up to 50 pounds, and weighs 15.65 pounds. The Jane Nanuq Lightweight Travel Umbrella Stroller has a five-position backrest that is suitable for children four months or older. The frame is made from durable, lightweight aluminum tubing and has an adjustable handle. The upholstery is cotton/polyester blend. The sunshade is made from neoprene, is windproof and waterproof, and has an SPF of 50+. For better maneuverability, this stroller has eight 6.3″ Ethylene-Vinyl Acetate (EVA) dual wheels and the PushWithEase ™ system. It has an extra-large storage basket, a cup holder, and a rain cover. With a side handle, the SpaceSaver ™ fold system allows this Jane Nanuq stroller to fold to 3″ which is 20-percent smaller than other strollers. It is 15 pounds and can hold a child up to 50 pounds. With both American Society for Testing and Materials (ASTM) and Consumer Product Safety Council (CPSC) certification, you can be sure the Amzdeal Airplane Lightweight Stroller is a safe stroller for your child. It has a steel frame, an Oxford cloth sunshade with window, a five-point safety harness, and a tether strap. The Pull Rod One-hand Fold design with auto-lock makes it easy to close and store it in a car or in overhead storage on a plane. It has six small all-terrain tires with locking rear wheels. The dual anti-shock front wheels provide 360° maneuverability. Although, dual wheels do have a tendency to catch on rougher terrain. The padded seat adjusts and reclines for your child’s comfort. 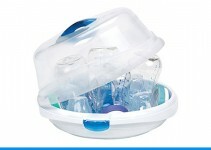 It has a storage basket and a removable padded bumper bar. 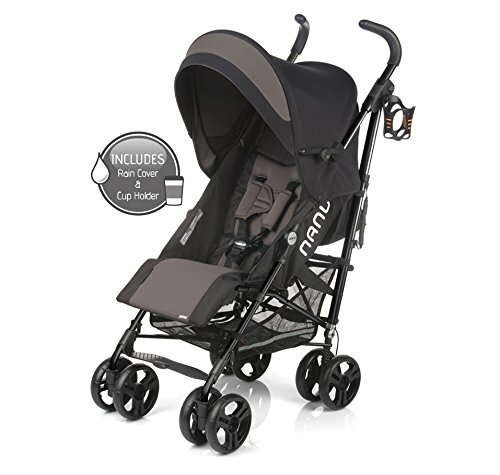 This Amzdeal stroller folds to 22.7″ x 17.8″ X 11.6″, weighs 14.7 pounds, and holds a child up to 44 pounds. The J is for Jeep Brand North Star Stroller is certified by Juvenile Products Manufacturers Association (JPMA). It has a durable frame, an expanding sunshade with visor, and 5.5″ dual front and rear wheels. Dual wheels perform better on paved surfaces. 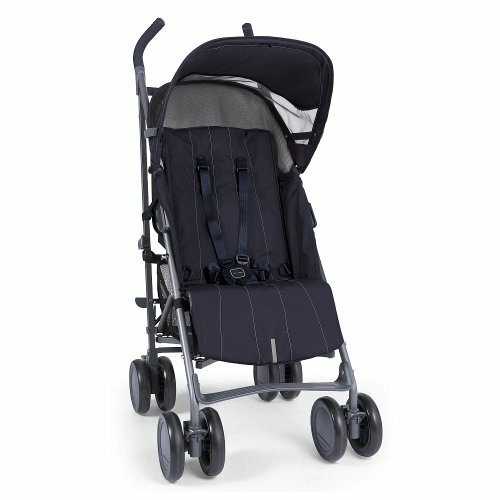 However, this Jeep stroller has swivel wheels and a front suspension for better control. For warmer weather, the padded seat rolls up, giving your child a cool mesh seat and a headrest. The three-point harness keeps your child safe, and the footrest and calf support provide a comfortable ride for your child. There is a storage basket underneath the seat, a removable storage bag on the back, a cup holder for parents, and 40″ high handlebars with extra-long, easy grip foam. It offers an umbrella-fold mechanism and measures 44″ long x 11.5″ wide x 7.75″ deep folded. Unfolded, it measures 31.5″ long x 18.1″ wide x 42″ high, weighs 9.9 pounds. It holds a child up to 40 pounds. 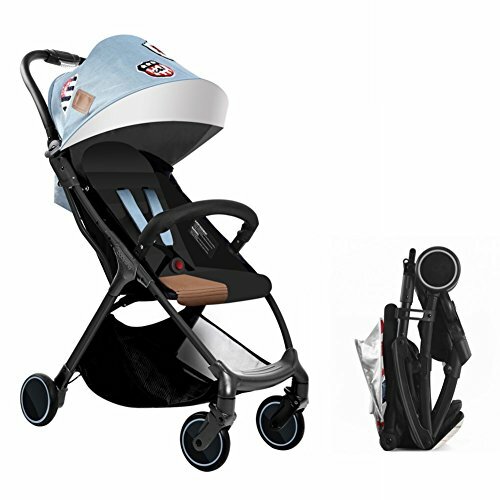 The Summer Infant 3D Lite Convenience Stroller has an aluminum frame; a large, four-position, reclining seat; dual anti-shock front wheels; dual, lockable rear wheels; and a five-point harness that adjusts to three heights. Since the seat fully reclines, it can be used by newborns. In addition, it has a sun visor on the removable and adjustable canopy with 99.9-percent UV protection, a rear storage pocket, an extra large storage basket, and a cup holder. 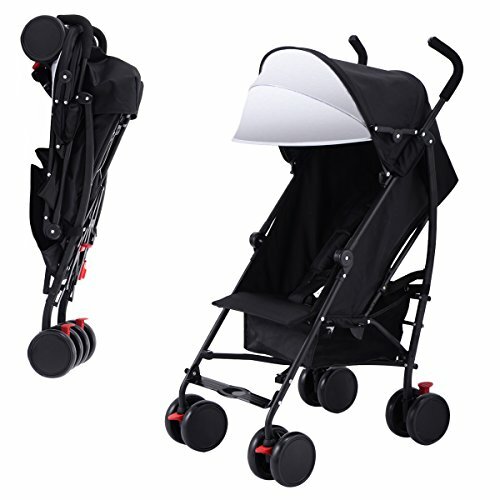 The easy umbrella includes auto-lock, and the Summer Infant Stroller has a carrying strap. It weighs 13 pounds and holds a child up to 50 pounds. The Costzon Umbrella Stroller has a durable steel frame; an adjustable, 300-denier Oxford cloth sunshade; a three-point safety harness; and Polypropylene (PP) cotton seating. It offers a storage basket under the seat. The rear wheels are lockable with foot-operated brakes. It weighs 16 pounds, is for children from seven months to three years, and children up to 33 pounds. The guzzie+Guss Pender Umbrella Stroller offers an adjustable seat and leg rest, poly-cotton upholstery, a footrest enclosure, full suspension, reflective strips, and a large canopy with peek-a-boo window. There is a large storage basket under the seat and storage pockets in the back. It has an umbrella fold mechanism with a shoulder strap and a carrying handle. It weighs 16 pounds and can hold a child up to 50 pounds. 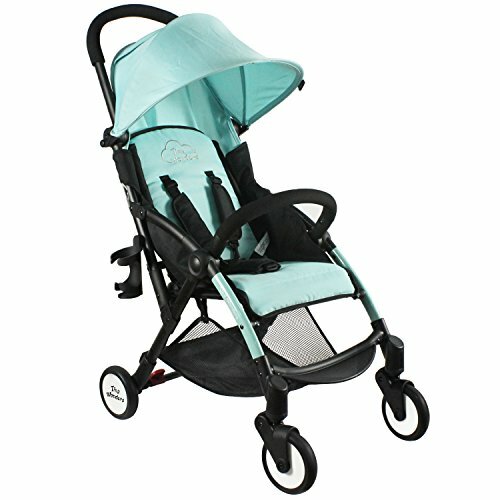 The Babysing S-GO Baby Umbrella Stroller has a durable aluminum frame, an adjustable back, sunshade with skylight, five-point safety harness, detachable armrest, and anti-shock single rubber tires with swivel tires in the front and brakes in the rear, The seating is either 600-denier waterproof Oxford cloth or denim. There is a large storage basket under the seat, storage pockets in the back, mosquito net, and a windproof cover. It measures 39.4″ x 24.4″ x 18.5″ unfolded, 19.7″ x 18.5″ x 7.1″ folded, weighs 10.8 pounds, and holds a child up to 55 pounds.